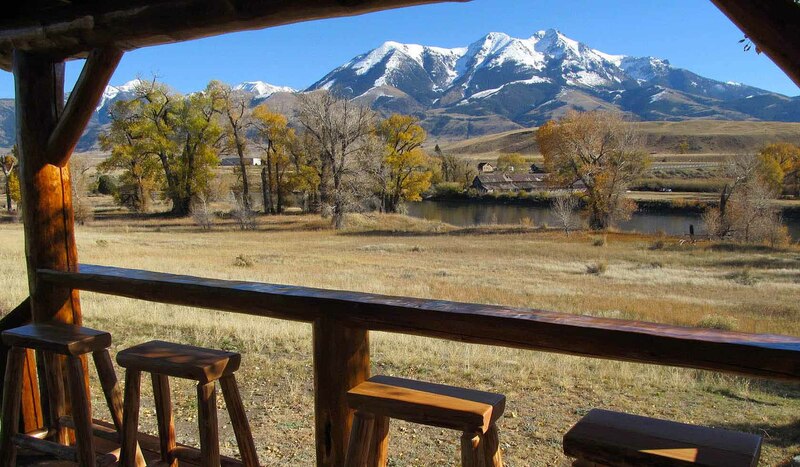 Privately located on twenty-nine acres, forty steps over dew-sprinkled grass takes you to one of the premiere blue-ribbon trout waters in Montana, the Yellowstone River. After casting #16 caddis flies to early morning feeders, return to your cabin for a homemade, gourmet continental breakfast to inaugurate your day on the river. After breakfast, spend the day with a top-quality guide fishing the the trout-filled waters of Paradise Valley: rolling rivers, rocky streams, or mountain ponds and lakes. Travel to Yellowstone National Park to catch and release two- and three-pound native Montana cutthroats while wandering among bison, elk and thermal geysers. And maybe with a little bit of luck you'll hit a grand slam (as we call it) by catching four of the major trout species in one day: the brook, rainbow, brown and cutthroat trout. At the end of your day in paradise tell stories about the one that got away as the moon sets over Emigrant Mountain and you anticipate the fishing tomorrow. Nearby is a hot springs to soak in.